The doctrine that volition is self-originating and unpredictable. That man is free to choose between certain courses of conduct was regarded by rabbinical Judaism as a fundamental principle of the Jewish religion. Although generally following the ethical system of the Stoics, Philo, influenced by Judaism, professed the doctrine of free will ("Quod Deus Sit Immutabilis," ed. Mangey, p. 279), and Josephus states that the Pharisees maintained it against both the Sadducees, who attributed everything to chance, and the Essenes, who ascribed all to predestination and divine providence ("Ant." xiii. 5, § 9; xviii. 1, § 5). "All is in the hands of God except the fear of God" is an undisputed maxim of the Talmud (Ber. 33b; Niddah 16b). 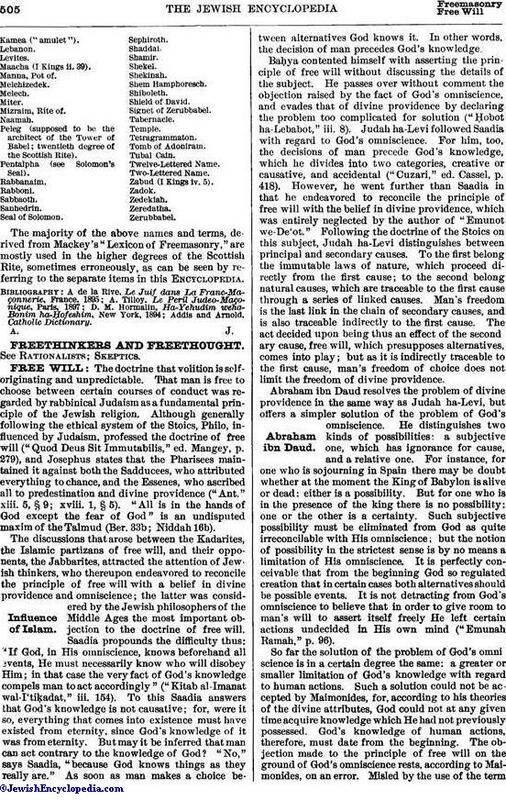 The discussions that arose between the Kadarites, the Islamic partizans of free will, and their opponents, the Jabbarites, attracted the attention of Jewish thinkers, who thereupon endeavored to reconcile the principle of free will with a belief in divine providence and omni-science; the latter was considered by the Jewish philosophers of the Middle Ages the most important objection to the doctrine of free will. Saadia propounds the difficulty thus: "'If God, in His omniscience, knows beforehand all events, He must necessarily know who will disobey Him; in that case the very fact of God's knowledge compels man to act accordingly" ("Kitab al-Imanat wal-I'tiḳadat," iii. 154). To this Saadia answers that God's knowledge is not causative; for, were it so, everything that comes into existence must have existed from eternity, since God's knowledge of it was from eternity. But may it be inferred that man can act contrary to the knowledge of God? "No," says Saadia, "because God knows things as they really are." As soon as man makes a choice between alternatives God knows it. In other words, the decision of man precedes God's knowledge. Baḥya contented himself with asserting the principle of free will without discussing the details of the subject. He passes over without comment the objection raised by the fact of God's omniscience, and evades that of divine providence by declaring the problem too complicated for solution ("Ḥobot ha-Lebabot," iii. 8). Judah ha-Levi followed Saadia with regard to God's omniscience. For him, too, the decisions of man precede God's knowledge, which he divides into two categories, creative or causative, and accidental ("Cuzari," ed. Cassel, p. 418). However, he went further than Saadia in that he endeavored to reconcile the principle of free will with the belief in divine providence, which was entirely neglected by the author of "Emunot we-De'ot." Following the doctrine of the Stoics on this subject, Judah ha-Levi distinguishes between principal and secondary causes. To the first belong the immutable laws of nature, which proceed directly from the first cause; to the second belong natural causes, which are traceable to the first cause through a series of linked causes. Man's freedom is the last link in the chain of secondary causes, and is also traceable indirectly to the first cause. The act decided upon being thus an effect of the second ary cause, free will, which presupposes alternatives, comes into play; but as it is indirectly traceable to the first cause, man's freedom of choice does not limit the freedom of divine providence. Abraham ibn Daud resolves the problem of divine providence in the same way as Judah ha-Levi, but offers a simpler solution of the problem of God's omniscience. He distinguishes two kinds of possibilities: a subjective one, which has ignorance for cause, and a relative one. For instance, for one who is sojourning in Spain there may be doubt whether at the moment the King of Babylon is alive or dead: either is a possibility. But for one who is in the presence of the king there is no possibility; one or the other is a certainly. Such subjective possibility must be eliminated from God as quite irreconcilable with His omniscience; but the notion of possibility in the strictest sense is by no means a limitation of His omniscience. It is perfectly conceivable that from the beginning God so regulated creation that in certain cases both alternatives should be possible events. It is not detracting from God's omniscience to believe that in order to give room to man's will to assert itself freely He left certain actions undecided in His own mind ("Emunah Ramah," p. 96). So far the solution of the problem of God's omniscience is in a certain degree the same: a greater or smaller limitation of God's knowledge with regard to human actions. Such a solution could not be accepted by Maimonides, for, according to his theories of the divine attributes, God could not at any given time acquire knowledge which He had not previously possessed. God's knowledge of human actions, therefore, must date from the beginning. The objection made to the principle of free will on the ground of God's omniscience rests, according to Maimonides, on an error. Misled by the use of the term"knowledge," people believed that all that is requisite for their knowledge is requisite also for the knowledge of God, The truth is "that the fact that God knows things while they are in a state of possibility—when their existence belongs to the future—does not change the nature of 'possible' in any way; that nature remains unchanged; and the knowledge of the realization of one of several possibilities does not yet affect that realization" ("Moreh," iii. 20). As to the question of divine providence, Maimonides did not even attempt to bring it into harmony with the principle of free-will. 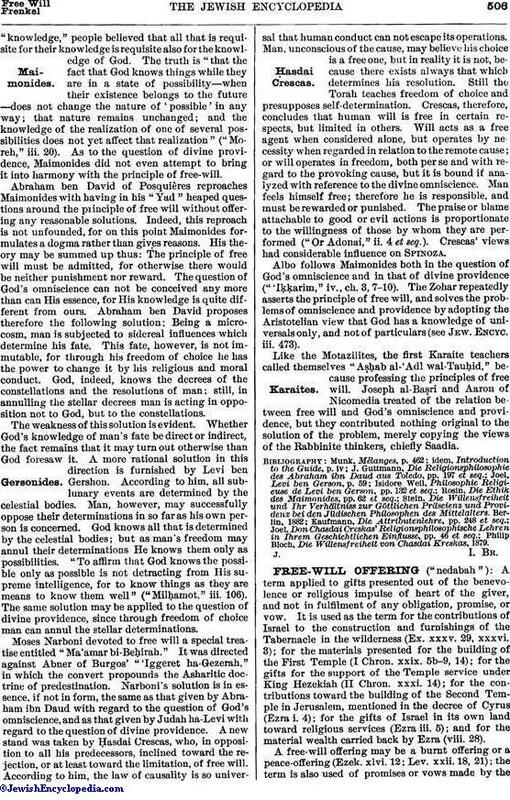 Abraham ben David of Posquières reproaches Maimonides with having in his "Yad" heaped questions around the principle of free will without offering any reasonable solutions. Indeed, this reproach is not unfounded, for on this point Maimonides formulates a dogma rather than gives reasons. His theory may be summed up thus: The principle of free will must be admitted, for otherwise there would be neither punishment nor reward. The question of God's omniscience can not be conceived any more than can His essence, for His knowledge is quite different from ours. Abraham ben David proposes therefore the following solution: Being a microcosm, man is subjected to sidereal influences which determine his fate. This fate, however, is not immutable, for through his freedom of choice he has the power to change it by his religious and moral conduct. God, indeed, knows the decrees of the constellations and the resolutions of man; still, in annulling the stellar decrees man is acting in opposition not to God, but to the constellations. The weakness of this solution is evident. Whether God's knowledge of man's fate be direct or indirect, the fact remains that it may turn out otherwise than God foresaw it. A more rational solution in this direction is furnished by Levi ben Gershon. According to him, all sublunary events are determined by the celestial bodies. Man, however, may successfully oppose their determinations in so far as his own person is concerned. God knows all that is determined by the celestial bodies; but as man's freedom may annul their determinations He knows them only as possibilities. "To affirm that God knows the possible only as possible is not detracting from His supreme intelligence, for to know things as they are means to know them well" ("Milḥamot," iii. 106). The same solution may be applied to the question of divine providence, since through freedom of choice man can annul the stellar determinations. Moses Narboni devoted to free will a special treatise entitled "Ma'amar bi-Beḥirah." It was directed against Abner of Burgos' "'Iggeret ha-Gezerah," in which the convert propounds the Asharitic doctrine of predestination. Narboni's solution is in essence, if not in form, the same as that given by Abraham ibn Daud with regard to the question of God's omniscience, and as that given by Judah ha-Levi with regard to the question of divine providence. A new stand was taken by Ḥasdai Crescas, who, in opposition to all his predecessors, inclined toward the rejection, or at least toward the limitation, of free will. According to him, the law of causality is so universal that human conduct can not escape its operations. Man, unconscious of the cause, may believe his choice is a free one, but in reality it is not, because there exists always that which determines his resolution. Still the Torah teaches freedom of choice and presupposes self-determination. Crescas, therefore, concludes that human will is free in certain respects, but limited in others. Will acts as a free agent when considered alone, but operates by necessity when regarded in relation to the remote cause; or will operates in freedom, both per se and with regard to the provoking cause, but it is bound if analyzed with reference to the divine omniscience. Man feels himself free; therefore he is responsible, and must be rewarded or punished. The praise or blame attachable to good or evil actions is proportionate to the willingness of those by whom they are performed ("Or Adonai," ii. 4 et seq.). Crescas' views had considerable influence on Spinoza. Albo follows Maimonides both in the question of God's omniscience and in that of divine providence ("'Iḳḳarim," iv., ch. 3,7-10). The Zohar repeatedly asserts the principle of free will, and solves the problems of omniscience and providence by adopting the Aristotelian view that God has a knowledge of universals only, and not of particulars (see Jew. Encyc. iii. 473). Like the Motazilites, the first Karaite teachers called themselves "Aṣḥab al-'Adl wal-Tauḥid," because professing the principles of free will. Joseph al-Baṣri and Aaron of Nicomedia treated of the relation between free will and God's omniscience and providence, but they contributed nothing original to the solution of the problem, merely copying the views of the Rabbinite thinkers, chiefly Saadia. Philip Bloch, Die Willensfreiheit von Chasdai Kreskas, 1879.